"In the past year there has been a flurry of MOOC providers announcing online degrees or their plans for online degrees. EdX announced their first online degree with Georgia Tech in January. Coursera announced two more online degrees (taking the total to four) in March, along with plans to offer up to twenty degrees by the end of 2019. "Coursera, one of the first MOOC providers to switch to a more aggressive, for-profit model, found that, by charging for their courses, completion rates jumped from 10% to 60%. Udacity’s premium courses include a hiring guarantee. If students don’t land a job after six months of completing a course, the company will refund their tuition." "...today’s 7,000 MOOCs sweep a landscape that includes 700 universities and 60 million participants worldwide. Coursera, one of the leading MOOC providers, just raised $64 million for an overall $800 million valuation, putting it in “unicorn territory” of $1 billion. Grow with Google recently invested $1 billion to provide digital skills, part of which will be through Coursera certificates." 200+ years ago it was "Covered Bridges"
a standing testament of continuous usefulness of technology from many years ago. But why they are built that way? Is it just to protect from snow and ice? Many "wood frame" houses are still build by using those simple techniques, despite all more advanced technology available today. It works and is reasonable affordable, but it does look like covered bridge compared with Golden Gate Bridge. What should the technology of houses be now, at the age of effective AI? "Make anywhere printing a reality with smart printers and scanners that seamlessly connect to a variety of smartphones and tablets. Our system controller solutions make it easy for original equipment manufacturers (OEM) to build leading smart printer products. An effective print management solution, connecting printers and scanners to the Internet offers users the freedom and flexibility to print from across the room or across town and addresses the hassle of relying on a fixed computer for printing." 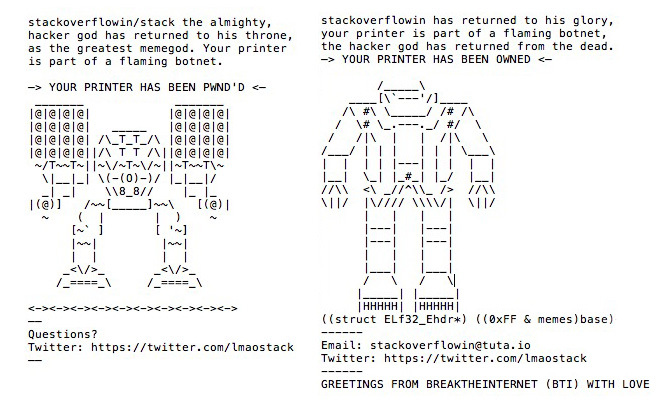 "Stackoverflowin claims to be a high-school student from the U.K. who is interested in security research. He said that for the most part he simply sent print jobs using the Line Printer Daemon (LPD), the Internet Printing Protocol (IPP) and the RAW protocol on communications port 9100 to printers that didn't require authentication."